Cell counting is an integral part of assessing the results of cell isolation procedures. For best results, a total nucleated cell (TNC) count should be performed using 3% Acetic Acid with Methylene Blue. 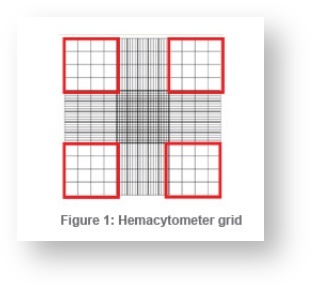 This video outlines how to prepare and count stained cell samples using a hemocytometer. This counting method determines the TNC count in a sample. The acetic acid lyses the cellular membranes, and the methylene blue stains the exposed nuclei. Because mature red blood cells lack nuclei, they are excluded from this count. Prepare an appropriate dilution of the well-mixed single cell suspension using PBS or serum-free medium. For an accurate representation of concentration, use at least 20 µL of cell suspension to make the dilution. Note: The appropriate dilution will result in a cell concentration that gives 50-100 cells per square (i.e. large or major square) in the hemocytometer. We recommend starting with a 10-fold dilution, but the appropriate dilution factor will depend on the approximate number of cells present in the starting sample. Cover a clean hemocytometer with a clean cover slip. Using a capillary tube or pipettor, apply a small drop (about 10 µL) of the stained, diluted cell suspension to the surface of the hemocytometer at the edge of the coverslip, being careful not to move the coverslip. Place the hemocytometer on the stage of a binocular light microscope, adjust the microscope to 10x power and focus on the cells. 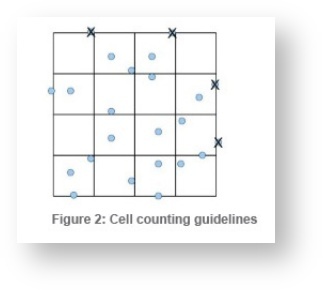 Count the cells (stained nuclei) in each of the four outside squares of the hemocytometer (Figure 1), including cells that lie on the bottom and left-hand perimeters, but not those that lie on the top and right-hand perimeters (Figure 2). A minimum of 100 cells should be counted. Note: If there are more or fewer than approximately 100 cells per major square on the hemocytometer, prepare a new diluted sample using a greater or smaller dilution factor.